He made it himself out of the the posts he removed from their deck railing. He was replacing them with metal ones so that it will be safer for the grandkids so the wood would have gone to waste if he hadn't made something out of it. I'm so glad he thought of me and went this route. Now I just have the job of trying to keep the plants alive. 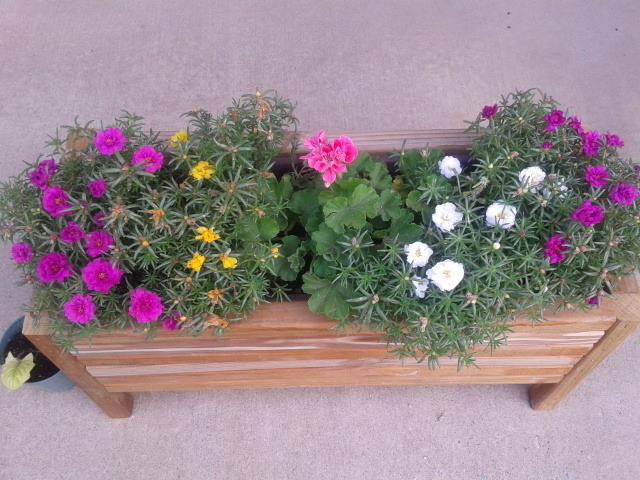 The one in the middle is a geranium while the others are rose moss. It stands about a foot tall and is about 2 feet long. The little pot you see on the ground beside it is what is clinging to life of a daisy I got from my boss last year. I'm still trying to keep it alive but it desperately needs some fertilizer that I don't have and probably a bigger pot too. I don't think it was ever meant to last so long and I had though I had killed it a couple months ago and then more green showed up. Go figure. I love flowers, but I am terrible at keeping them alive! Awww awesome dad you have so very thoughtful of him, oh don't get me started on plants I had my fare share of plants that I don't have no luck with and have lost more than my fare share of them. Some times it's not you or the plant but, the direction you're living in, like I found that certain plants prefer to thrive when facing the south and north rather than east and west. I don't know about where you live but, the dollar stores out here sell planters pots in different sizes and some times WalMart has sales on their soils in small bags.